Pine Barrens Adventure Camp Coming Up! With the recent medical issues behind me, I am gearing up for the Pine Barrens Adventure Camp in about 2 weeks. Although a bit out of shape from the recovery from the melanoma surgery, I am looking forward to the camp and getting the GSA off the road. 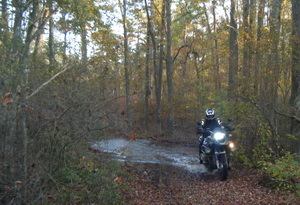 My last real training on the big bike (1200 GS) was over 3 years ago when I took the Rawhyde course in Pittsburgh. I have done very little off road riding, except for about 600 miles of gravel enroute to Prudhoe Bay last summer. Currently back to a couple of miles a day and some light weight training, so should be good to go in about 10 days. Promises to be fun and certainly will push the skills envelope and this tired, nearly 60-yr old body. Hope to get the bike prepared this week-end by removing the accessory lights, removing the mud guard (always falls off anyway), adding the TKC 80 tires and a couple of more items. Have to dig out the BMW Rallye riding gear. A summary of the course can be found in my previous post of February 2. Stay tuned for the gory details! 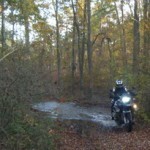 This entry was posted in Motorcycling, Uncategorized and tagged adventure motorcycling, Adventure Riding Training, BMW Motorcycles, Pine Barrens Adventure on April 16, 2013 by Ted.